I met Marcello Cambi in the splendid library in Mackenzie Castle which dominates Genoa from its towering hilltop. Marcello Cambi and his three sons transferred their family's prestigious auction house to the castle. The Cambis' numerous family members are united by a single passion, the love of art. Our chat began in complete simplicity. Cambi Auctioneers came about thanks to the experience of an Antiques dealer, Marcello Cambi, who has been in the business in Genoa for over twenty years, and the work of his sons Matteo and Sebastian who have changed their fathers business into an Auctioneers. Up until February 2004 viewings and auctions took place over the three floors of the nineteenth century palazzo situated in the quiet, private but very central Salita della Tosse (literally Cough's Hill). 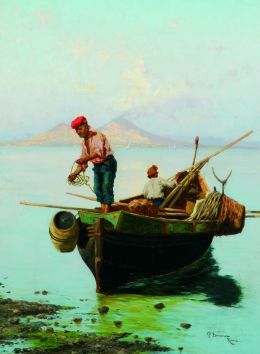 Over the five years in business more than forty auctions have taken place at Cambi's Auctions resulting in events of great relevance such as the sale of the furniture of Villa Toscanelli at Pontadera and those of Villa Fossati Raggio in Genoa as well as the sale of the paintings and furniture belonging to the Genoese painter Oscar Saccorotti. 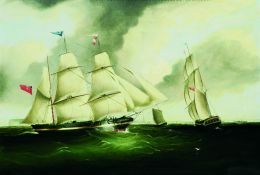 Antiques apart, two auctions a year dedicated to the decorative arts of the XXth century take place together with that of paintings and objects of maritime art. In the past, theme auctions have been organised regarding fabrics, frames and scientific instruments. Each auction is preceded by an accurate collection of the material and a careful exhibition of the goods nurturing a close cultural rapport between the Cambi family and prospective buyers which is indispensable. In 2002, the Cambi Auctioneers purchased from Mitchell Wolfson Jr, the Mackenzie Castle where the entire business of Auctioneering has been taking place since September 2004 as part of a successful expansion plan which has made Cambi's one of the market leaders in their sector. Castle Mackenzie was built between 1893 and 1905 by the young and then unknown Architect Gino Coppedè, it was commissioned by Evan Mackenzie of Scottish origin but a florintine by adoption who dealt in insurance by trade. Defined as "A King's Whim", regarded as one of the major examples of the revival of nineteenth century taste and initially designed as a villa with tower, it took its present form in answer to the ever increasing demands of its owner extended to the designer. The Castle was inhabited by the Mackenzie's for twenty seven years: after Evan's death in 1935, his daughter Isa sold it four years later to a property developer. During the second world war it was at first occupied by the German army and later by the allied forces, whereas it became the headquarters of the Italian Carabinieri in the fifties. In 1956 it was declared a National Monument in recognition to what is only today known as the Coppedè style. Vacated by the armed forces, it hosted many a business in the sixties and seventies, including a gymnasium whose tenancy was responsible for the state of general abandon, interference with the original structure and theft of the furnishings. In 1986 it was purchased by the American tycoon Mitchell Wolfson Jr. with the purpose of hosting his collection of early twentieth century works of art and objects, and to offer a museum to the city; after completing the restoration of the exteriors in 1995, works were suspended. In 2002 the building was bought by Cambi Auctioneers. Despite the renaissance appearance, the construction techniques were certainly ahead of their time considering the period in which building began: the building was equipped with central heating, hot and cold water in each bathroom, an indoor heated swimming pool with annexed sauna as well as with a lift with a load capacity for twenty five people. A vast use of iron was made both to bolster and to decorate during its construction, but the indiscriminate use of this material, caused serious problems to the stone due to rust which ate its way through over the years. The castle was built over an existing villa the remains of which are still visible around the outer walls, Coppedè chose to add to the existing structure with girders and brickwork, sandstone from La Spezia, towers and niches, jutting stairs and battlements in an array of references to the tuscan renaissance through the ceramics in Della Robbia style, coat of arms, brass plates, stained-glass windows, further references to Palazzo del Mangia, to Palazzo Vecchio, and through a copy of the chandelier known as the "Galileo" even holding the Pisa Cathedral as an example. Coppedè's work proved instrumental during construction as they executed boiseries and numerous panelled ceilings fitted to a number of rooms in the castle, evoking a sixteenth century style. The most interesting areas of the castle, are the main hall from which access to Via Cabella is gained, the library and the Chapel which is annexed to the first floor. The hall is certainly the most articulate space as it hosts the hall itself as well as the imposing staircase leading to the first floor. The furnishing comprises a copy of the Venus, a mammoth fire place, high wrought iron gates which divide the hallway from the internal court of the castle, and also a three seat marble throne: the walls show remains of the tempera paintings by Carlo Coppedè depicting the Mackenzie family in a historical context. The library extending over two floors connected by a wooden spiral staircase, hosted the vast Mackenzie collection but not, the precious works by Dante comprising over one thousand volumes including rare editions of the XV and XVI centuries which were instead housed in the "Dantonian" room within the tower and given as a present to the city of Genoa by his daughter after her father's death ( today they can be found in the Berio Library). The gothic Chapel, hosts in its narrow space some of the Castle's more beautiful objects such as the pipe organ, two copies of the Blessed Angelico ( Annunciation and Resurrection) wooden stalls made by "La Casa Artistica" (the Artistic House) of the Coppedès' and stained-glass windows. Mass would be celebrated here on special occasions, and indeed the Archbishop of Genoa Monsignor Minoretti, celebrated Mackenzie's niece's wedding in this chapel. Set out on four floors over cellars and dungeons, the castle boasts eighty-five rooms, an area of 4000 square metres and a volume of some 16000 cubic metres. Mr.Cambi how did you start working in the world of auctions? It's a family tradition, I come from a Florentine family you know, my father had already started dealing with objects of art. When he died I moved to England, where I made a living by restoring frames and in auction houses. In those years I really reaped a lot of experience. When did you move to Genoa, Mr.Cambi? I moved to Genoa out of love, in as much as I married a Genoese lady. In 1967, I opened a restaurant, together with four friends, called "A Begudda" a Genoese way of saying to binge. Basically it was a club with limited entrance where the cuisine was rigorously Genoese. The four of us were friends and partners. As of the beginning we had decided to leave our wives out of it, in the belief that it would have helped to preserve the established harmony. After three exceedingly positive years, instead, that experience ended too. Basically because two partners had left the business and when I realized that experience was over, I returned to my beloved England. what were the marine antiques situation like in England at the time? Would it be correct to affirm that you invented marine antique auctions? In a certain sense yes, I'd say so. In fact I remember that in those days nobody dealt with marine antiques and I'd add that there wasn't even a single antique dealer specialized in this field. Maybe, as an example, one could find a painting by Gavarrone or by Arpe but they were not taken into consideration more than so much. I remember that one could still find some splendid Diorami paintings which today have nearly disappeared. 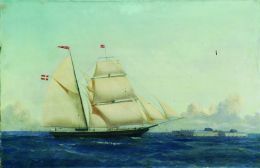 There were however a few lovers in that market niche who had marine paintings, so little by little, hardly noticing it, I discovered the marine market segment in England. A market that has grown in that country more than anywhere else in the world. 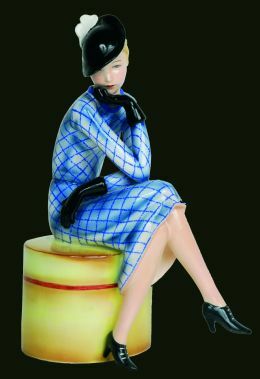 I still remember seeing at Sotheby's, 7 or 8 by Gavarrone all at the same time, it was magnificent. That trend, I must say, has ebbed away, there is very little around and above all, the little there is, is not very good. 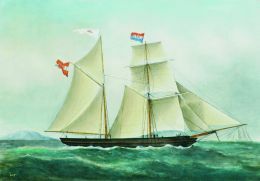 One must, furthermore, be very careful of counterfeits specially of "guaches" portraying portraits of ships. It has become a very fashionable sector and since there is little on offer, false paintings flourish. To be honest however, one has been able to find a few more pieces lately because the first generation collectors' items are coming back onto the market. There is also, naturally, a physiological renewal in auctions. Could you briefly explain your evolution starting from the first marine auctions to today's intense and differentiated activity of your auction house as we know it now, in this beautiful castle? At first I started dealing with 16th century Tuscan furniture. Then I worked for an auction house until I thought the moment had come for me to open my own. The Cambi auction house. I've recently diversified, together with my sons, into different fields with as many experts. 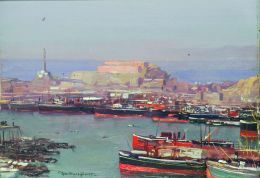 We are now expert in 20th century art which at the moment is very much sought after, in jewellery, in 19th and 20th century paintings, in antique carpets and in many other art sectors. How do art works generally turnover on the market? 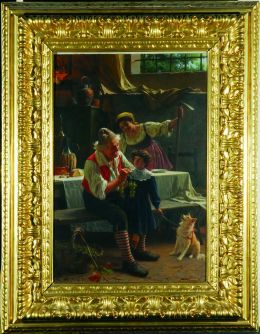 What normally happens is that a person or a collector, lets say, with a collection of 100 pieces which he has assembled over 20 to 30 years, suddenly gets bored with the objects that he has lovingly kept for so long and decides to sell them all or partially by simply ridding himself of a few items. What are the secrets that make an auction house successful? In the first place never give a client false expectations. I'll explain what I mean by that. Were I to value a piece at a price that it would not sell at, the client would obviously be unhappy and I would have given him an unsatisfactory service. As an expert, on the other hand, I cannot make an error in judgement by underestimating its worth. To give you a practical example, if I were to get an item at 15 and sell it at 22 I can reasonably claim that the client will be happy and that I've done my job well. The second other important point is to be able to interpret the market's trend. Here I must underscore that there is a fundamental difference between an art gallery and us. The gallery owner will choose, buy and sell a piece according to personal taste and passion whereas an auction expert must take into account the market's trend over the whole past year. The third and last secret is to have an innate love for auctions which is a fundamental requisite in doing this work with passion. You cannot imagine how satisfied I felt when a painter reached his Italian or world record thanks to us. In such cases it means that we were able to create the right atmosphere and organize the auction perfectly, taking into consideration all the variables or almost all of them, including our clients' tastes above all which are very variable indeed. Recent furniture auctions for example have given us a great deal of satisfaction. In time natural talent prevails and a sort of infallible instinct emerges, so to speak, which is a necessary quality to attain success in this field. Do a lot of people come to you for quotes? Of course. People come to us because our experience allows us to value any kind of object also thanks to our experts help. We obviously also do our best to satisfy everyone. A lot are from Genoa but the majority from elsewhere. How did you manage to buy Mackenzie Castle? By chance at first and immediately afterwards by choice. When it belonged to Wolfson, the American collector, I worked as an expert of the castle's wood items and in 2002 when it went up for sale, we bought it and began to restore it heavily, starting from the tower, the roofs and ending with the frescoes the fixtures and so on. In fact even if the work is still not finished, I think it was very brave of us to take on the task of restoring it, nonetheless now that the results can be seen we are really glad. Is this type of castle suitable for an auction house? I think it is ideal: the castle's drawing rooms are perfect to host furniture as are the glass showcases in hosting smaller or more fragile precious objects. Just as paintings of course find a natural environment too. It is also easier to load and unload goods in a convenient parking area, as in our case. The location is also very suggestive which helps a great deal. Other ideas for the future? A great many. One in particular has to do with this lovely library in chiselled walnut. We believe that it should become a library specialized in books on decorative art. Mackenzie is believed not to have had a good relationship with the Genoese, how did the city react to the restoration? I must say with benevolence. The castle before looked like a black hole that instilled fear. A lady wrote to us to thank us for leaving all the window lights on until midnight. Now its like a magical reassuring presence that watches from its hilltop over Genoa and its sea. She said. A lot has still to be done but when it will be finished I think it will be a very pleasant castle. With regard to Genoa do you think that it has changed a lot from when you first embarked on your career? Most certainly and for the better. At the beginning when I was in Genoa I remember the anguish one felt on Saturday and Sunday nights around at 8.30 - 9, when the "curfew" started. Now Genoa is different, there are a lot of interesting places and new entertainment opportunities and yet I think the city still has ample room for improvement. I suggest a walk in the historical city centre in the morning there is an intensive life of craftsmanship going on. One can sense a distinct fervour of qualitative activities that can hardly be matched by any other city. At night walking in the historical city centre is a little more difficult, when I was young it was much quieter with the exception of the usual Via Gramsci which was full of drunken sailors always ready for a fight. Another thing that I like a great deal about Genoa is the ease one has in reaching neighbouring sights with their little villages that look like a painting out of the 19th century. And then there is its deep blue sea and harbour area surrounded by marvellous steep bushy hills on which there are imposing castles and fortresses. 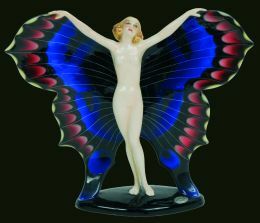 Gino Coppedè was born in Florence on 26 September 1866 to Mariano Coppedè and Antonietta Bizzarri. Following his initial studies, he studied at the Professional School of Industrial Decorative Art. In 1885 he started working for "La Casa Artistica" (The Artistic House) headed by his father. In 1889 he married Beatrice Romanelli who will bore him three daughters. In 1891 he enrolled at the Academy of Fine Arts in Florence where he graduated as Professor of Architectural Design and began teaching at the Regio Orfanotrofio Puccini of Pistoia ( Puccini Orphanage) in 1896. During the same year he was called to Genoa by Evan Mackenzie to project and design a castle in Via Cabella. Thanks to Mackenzie he obtained various assignments in Genoa. Between 1900 and 1910 he was asked to build a number of villas and castles by the more affluent Genoese high - society, but also received appointments in Tuscany and in the regions of Lombardy and Canton Ticino. In 1903 he was nominated "corresponding" Academic by the Royal Academy of Arts and Design of Florence whereas in 1908 he went on to be appointed "resident" Academic. During the same period he was often called to be part of the Council Buildings Commission for the city of Genoa and was also nominated Honorary Academic by the Linguistic Academy of Perugia and Urbino. In 1910 he was appointed Engineer by the "Reale Scuola di Applicazione" for the Engineers of Rome (Royal School of Engineers) where he in fact failed to win a national competition to teach General Architecture at the Royal University of Pisa. In 1919 he commenced constructing the residential area in Rome which would later carry his name, as well as a number of buildings in Messina. 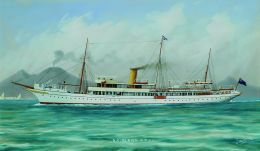 It was during these same years that he started working with his brothers on the furnishings of the first class areas of some of the Lloyd Sabaudo and Società Cosulich passenger ships. On 6 April 1920 his wife died to be followed by his father on 20 December of the same year. He then took over the management of "La Casa Artistica" together with his brother Adolfo. Between 1920 and 1921 he prepared the project to move the Termini railway station in Rome, in conjunction with a civil engineer by the name of Ugolotti. In 1924 he began the construction of the Castle of the Marchioness de la Montilla in Seville. In 1926 he was appointed Resident Professor Emeritus by the Academy of Arts and Design of Florence. He died in Rome on 20 September 1927. He is buried in Florence in the cemetery of S.Miniato in the family tomb. 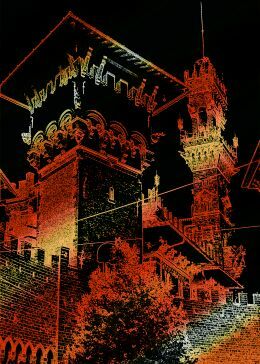 Villa Coppedè in Genoa, the Castle Turcke or Rocca Tirrena, the Officine San Giorgio of Sestri Ponente, the palaces of Zuccarino, Pastorino and Bogliolo, the Grand Hotel Miramare, the Micheli Castle (later Bruzzo) and Villa Canali are all considered to be his major works. Leaving the borders of the Liguria region, we find Villa Ambrosoli ad Acquaseria (CO), the Coppedè residential area in Roma, the Castle de La Motilla in Seville in Spain, Palazzo Cerruti in Messina and Palazzo Romagnoli in Florence destroyed during the Second World War. Notes taken from "The Coppedès' " by Rossana Bossaglia and Mauro Cozzi. Was born in Florence in 1852, to an adventurous Scotsman and a Serbian princess. After marrying Maggie Tenison in 1876, he took up residence in Genoa where he started a number of businesses in the insurance field. He founded the Mackenzie Administration, which gradually became an Agent to foreign companies of relevance such as Union Parisienne and Lloyds of London in that very city. Quite an innovator in dealing with unions and personnel, he was ahead of his time in finding new organisational and practical solutions for his staff: he was the first to employ women in his organisation, to adopt non stop working hours following the English model, and to offer his staff and their families a special package providing medical assistance, free medicines and funeral costs in the case of death. The offices of his companies were at first located in Piazza dell'Annunziata and later to Piazza della Meridiana, in a palazzo by the same name. After founding the Alleanza Assicurazione (Alleanza Insurance), he opened Società di Assicurazioni Iniziativa in 1891 and in 1903 he founded the Ausonia followed by the Consorziale in 1918. Apart from being a clever and energetic business man, he was also a valid sportsman with a passion for mountaineering: in 1890 he climbed the Monte Bianco (Mont Blanc) and three years later the Matterhorn. He had a house built in Courmayeur, in the district of Pourtud. Maggie Tenison bore him four children: the first born was William, who became a University Professor and dedicated his work to parapsychology, Fiammetta nicknamed Fede, who married an English doctor and moved to Great Britain, Isabella, who remained closest to her father and the last one Mario, who was born in 1890 and died in 1917 over the skies of Portsmouth after joining the RAF. 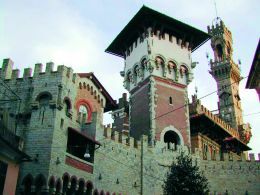 During the war, Mackenzie put his castle and offices to be converted into hospitals at the disposal of the authorities, whereas in 1922 on the occasion of the Genoa Conference he invited all the foreign delegations to a grand reception. After Mario's death which is commemorated on a plaque in the courtyard of the castle's chapel, Evan's wife never really recovered and died two years later in 1919. In the last few years of his life and following a visit to Japan in 1918, Evan spent time closely studying Japanese culture as well as his first passion as a youth: Tuscan art and the Renaissance period. 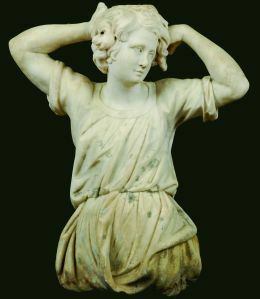 His true love however remained with his Dante collection comprising four very rare editions of the fifth century, all those of the sixth century and a further seven hundred volumes. He died in 1935 at 83 years of age, and his mortal remains are kept together with his wife's Maggie, in the small cemetery in Courmayeur.